“A major earthquake would produce significant damage and a possible partial collapse” at the school, California engineering firm Forell/Elsesser Engineers Inc. wrote in a 1983 report to the Anchorage School District. The firm was commissioned by the district after consultants determined the building — which was supposed to open in fall 1983 — was seriously flawed, news stories said. 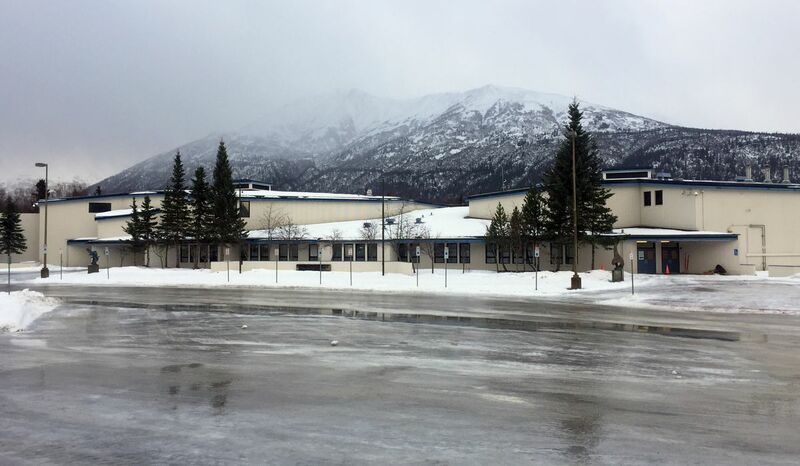 An investigation found errors in the engineering calculations and pointed out that the plans for the school didn’t receive oversight from Anchorage building inspectors, who some Eagle River builders resisted at the time. The district eventually retrofitted the school, which opened to students in 1984, but Forell/Elsesser warned that inherent design flaws would likely always be an issue. “It is not possible to overcome all deficiencies without major and costly reconstruction,” the company wrote. Among the problems outlined by engineers were a sagging roof truss, improperly formulated engineering calculations, stressed walls and what they argued was a fundamentally flawed design. On Nov. 30, 2018, a magnitude 7.0 earthquake shook the region and caused major damage at Gruening. No students or staff were injured and district officials have yet to detail the extent of damage to the school, but the building has been closed through at least the 2019-20 school year. Draft analysis reports are due this month, and public meetings on what to do with students from Gruening and Eagle River Elementary, which was also severely damaged in the earthquake, begin this week. Meetings on secondary education options will be held Feb. 12 and 21 at Chugiak High, and elementary options will be addressed Feb. 13 and 20 at Eagle River High. All meetings start at 6 p.m. The district is also seeking community input through an online survey. It’s still unknown whether the damage is related to the design and construction flaws identified in the early 1980s, but newspaper accounts from the period show officials knew even an expensive retrofitting wouldn’t mitigate the risk. 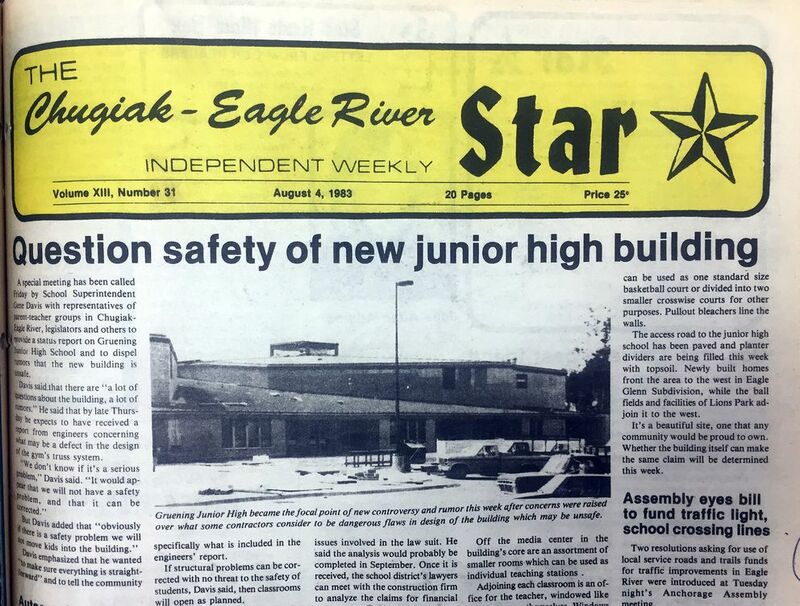 “A seismic risk will continue to a greater degree with a repaired building than if the building had been initially built in compliance with all standards," Forell/Elsesser Engineers Inc. wrote, according to a story in the Chugiak-Eagle River Star, which covered the issue on a nearly weekly basis in 1983 and 1984. In the late 1970s and early ’80s, Chugiak-Eagle River experienced a population boom, growing at four times the rate of neighboring Anchorage. With local school enrollment rising by more than 7 percent a year, Gruening was touted as a state-of-the-art solution to overcrowding at Chugiak High School, which was already over capacity housing both middle and high school students. In 1978, voters approved a bond package to build a new junior high in Eagle River. With an initial cost of $15 million and design by the architectural firm of Lane, Knorr and Plunkett, groundbreaking took place April 2, 1982. ASD quickly hired Unwin, Scheben, Korynta and Huettl (USKH) Inc. to finish overseeing the project, but the district soon learned its problems were only beginning. That summer, contractor Rogers and Babler sued the district asking for additional funds and claiming the architectural drawings for the school were inadequate. By fall 1983, major issues with the building’s design began to become apparent, and rumors were flying about safety and design issues at the unfinished school. In August, the district called a public meeting to discuss the situation with parents. “Obviously if there is a safety problem we will not move kids into the building,” Davis said at the time. As the district scrambled to fix the school, some began to wonder whether the problems could have been avoided through a more thorough municipal review process. Chugiak-Eagle River lies within the Municipality of Anchorage but is outside the muni’s “building safety area,” where building projects face stricter oversight. In mid-August, “enough red flags” had been raised that Davis announced the new school would not open for at least the first half of the 1983-84 school year. The main issue was the roof, which engineers said included a poorly designed and constructed truss system that was sagging over the gym. The district commissioned further study of the problem, which Davis was concerned could be larger than just the faulty truss. “As the system spreads out through the building, we don’t know if the connections (with the faulty truss) will meet seismographic requirements and snow load specifications,” Davis said. By the start of the 1983-84 school year, 767 junior high students from Gruening were “double-shifting” with about 1,500 high school students at Chugiak, with senior high classes starting at 6:30 a.m. and junior high classes beginning at 12:45 p.m. When the engineering report came back, the true scope of the school’s issues came to light. “Eye Gruening Demolition” read a headline in the Sept. 29, 1983, edition of the Star. Beneath the headline, Star reporter Ed Bennett described a report compiled by San Francisco-based Forrell/Elsesser in which the engineering firm detailed serious structural and design issues with the building. “The conceptual problem was essentially a criticism of the way the overall shape of the new school would react to the stress of an earthquake,” Bennett wrote of the report. According to Bennett’s story, the report cited “discontinuities” within the school’s three-section design featuring a central core with two classroom wings — a design the engineering firm said would cause the sections to move independently of each other in a large quake. At the time, architect Michael Plunkett blasted the firm’s conclusions. “It’s clear the San Francisco people like box-shaped buildings,” Plunkett said. Among the other issues detailed in the report were 12 specific violations of the Uniform Building Code, as well as roofs in the gym and multipurpose room that were “overstressed by a factor of three,” cinderblock walls in the music rooms that were too tall for their thickness, and roofs and floors in the classroom wings that were too long in relation to their width. The report was critical of design work done by Plunkett and engineering done by the firm he hired, SWR/Barkshire. More red flags went up after a magnitude 6.4 earthquake struck Sept. 6, 1983. 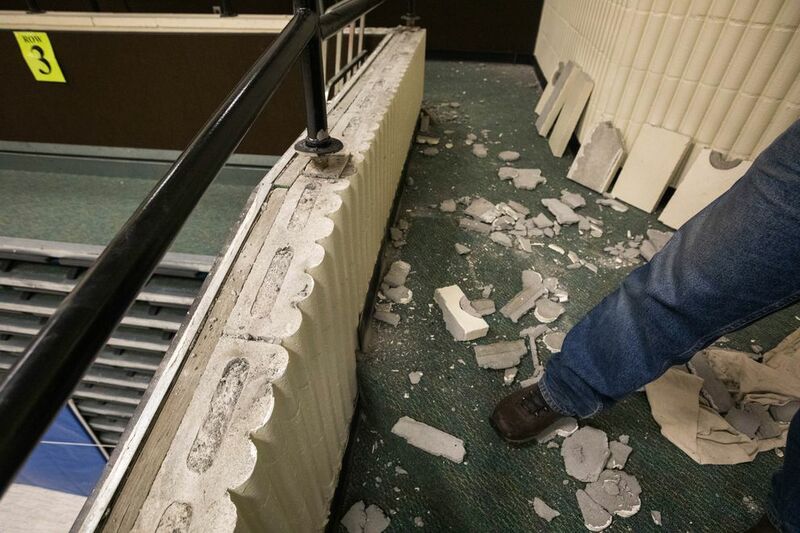 According to the Star, ASD building official Bill Echols said the quake caused hairline fractures in more than 20 doors at the school as well as a crack running up a cinderblock wall. Plunkett denied the engineers’ assessment, but the preliminary findings caused the district to commission an even more extensive report. “Nonsense, I just can’t believe that,” he said. “One of the demands is to keep the building acting as a whole element. We can’t let it separate at its discontinuities. That’s a major concern,” he said. Following his report, the school board unanimously voted to authorize his firm to come up with a plan to fix the school. By that time, the school had caused a flurry of lawsuits to be filed by the district, contractor and architect against one another in the summer and fall of 1983. Near the end of 1983, the school district reached an agreement with SWR/Barkshire to do the design work to fix the school’s problems for free. The firm also promised not to use the employees who made mistakes in the original plans, according to a Nov. 23, 1983, story in the Star. When Forell/Elsesser’s final report on how to fix the school came back, the conclusions were dire. According to the engineers, more than 400 places in the school would need to be reinforced, braced, strengthened or replaced in order to bring the school up to compliance with the Uniform Building Code. “The report said many of the school’s structural problems occurred when a mistake was made in the very early design phase, when the overall ability of the building to resist earthquakes was calculated,” Bennett wrote in a Dec. 1, 1983, Star story. Additionally, the report found the school design lacked “continuity,” which could cause the building to fail in an earthquake. The report suggested the school district strengthen the school to bring it up to code by making approximately 420 fixes to walls, floors ceilings and beams at the school. By February 1984, plans for reconstruction had been made available to the public for viewing at the public library. Needed repairs included fixing the sagging roof truss, attaching steel columns to walls and buttressing cinderblock walls. Oregon-based Todd Construction was awarded a contract to make repairs, which were supposed to begin in the spring. Though there were several delays due to increased oversight by the municipal building department, by April officials were expressing optimism the school could open by the 1984-85 school year. “It looks good that we will be able to move into a safe, repaired Gruening Junior High School by the opening day of school,” said Bill Echols, project manager for Heery Program Management, a consulting firm that oversaw several ASD building projects. Permits were issued for reconstruction in May, and by June Echols said repairs were proceeding on schedule. At that time, the estimated cost of the school — which was designed to hold 800 students — had ballooned to more than $27 million due to repair costs, litigation and additional consulting fees. In August, district officials assured the public that the school was safe and ready to open. Gruening opened Aug. 27, 1984, with an enrollment of about 810 students. When the magnitude 7.0 earthquake struck on Nov. 30, 2018, roughly 600 students were enrolled at Gruening. The quake caused enough damage to shutter the school through next school year. Since then, Gruening students have been attending classes in the same building that previous middle-schoolers did before the school was built in the early 1980s — Chugiak High. CORRECTION: A previous version of this story left out the word ‘not’ from the Oct. 27, 1983 Star editorial quote and misspelled the name of contractor Rogers and Babler.